M+B is pleased to announce THE EYE OF BAMAKO, an exhibition of over thirty contemporary and vintage gelatin silver prints and chemises by internationally acclaimed Malian photographer Malick Sidibé. The 75-year old “Eye of Bamako’s” magnificent portraits of sweeping personal and cultural changes in post-colonial Africa have been celebrated around the world. 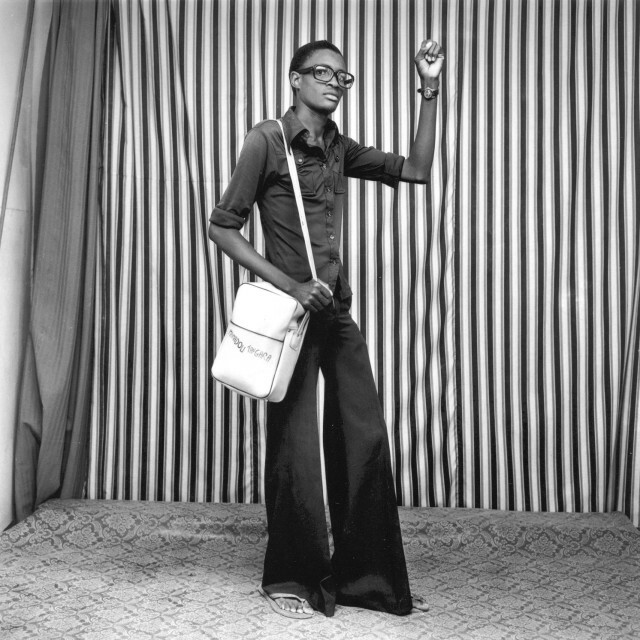 Relatively unknown outside of Mali until the mid-1990s, Malick Sidibé was the first photographer to receive the prestigious Venice Biennale’s Golden Lion for Lifetime Achievement in 2007. This exhibition will include his iconic black and white photographs that recorded the history of his countrymen as well as the lesser-known “chemises”, or vintage proof sheet style works on construction paper. Positioned at the junction of Malian independence and a period of rapid modernization, the works exhibited bear witness to the joy, insouciance, and confidence of Africa’s youth revolution. The exhibition will run from February 5 through April 9, 2011, with an opening reception on Saturday, February 5, 2011 from 6 – 8 pm. Sidibé’s ebullient images take place in a variety of settings: either outdoors in one of Mali’s newly minted nightclubs, house parties spinning the latest James Brown album, picnics on the banks of the River Niger, or indoors at Studio Malick. Regardless of setting or content, all his portraits vibrate with an energy that comes from mutual trust and collaborative effort between artist and subjects. As a privileged documentarian of tremendous cultural change, Sidibé’s distinguished work is both memoir and testimony to youth culture. Beginning his photographic career as an apprentice at Gérard Guillat-Guignard’s Photo Service Boutique, the European “GG” would take photos of the white events, while Sidibé would record African events. In 1958 he opened his own studio to take photographs of “Africans for Africans,” and by 1965, the young people knew to go to Studio Malick with their Vespas and latest goods straight from Saint Germain des Près. Sometimes the props in the portrait did not belong to the client but reflected the aspiration of the sitter, making Studio Malick a powerful place to realize the dreams of an emergent culture. Born in 1935 outside of Bamako, Mali, Malick Sidibé continues to run Studio Malick with the help of his sons. Since the initial world premier of his work in 1997, Sidibé has received the Hasselblad Award for Photography (2003), the Venice Biennale’s Lifetime Achievement Award in 2007, and the International Center of Photography's Infinity Award for Lifetime Achievement (2008). His work has been exhibited at the Fondation Cartier (2004), Philadelphia Museum of Art (2004), Corcoran Museum of Art (2004), and can be found in the permanent collections of The Metropolitan Museum of Art (New York), Museum of Modern Art (New York), SFMoMA (San Francisco), Birmingham Museum of Art, Studio Museum of Harlem, High Museum of Art (Atlanta), and the ICP (New York). This will be his first exhibition with M+B and is held in association with Fifty-One Fine Art Photography.